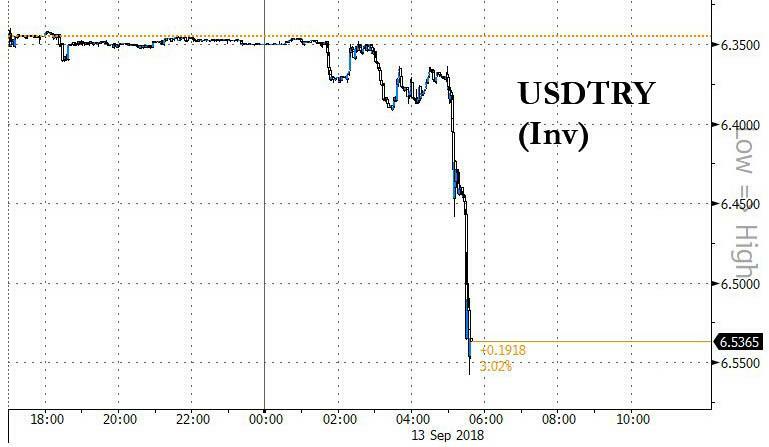 After a few weeks of relative stability in the Turkish Lira - the currency many say started the current EM turmoil - moments ago the TRY collapsed after Erdogan decided to slam the country's "independent" central bank. Just hours before a widely expected, and much needed to restore investor confidence, rate hike by the Turkish central bank, President Recep Erdogan decided to attackd the central bank out of the blue for "continuously missing inflation targets" just two hours before the bank announces its interest rates decision. "I have never seen the central bank meeting its year-end inflation forecast," Erdogan said in speech at Confederation of Turkish Tradesmen and Craftsmen meeting in Ankara. Stating that inflation is the result of wrong steps by central bank, Erdogan warned the central bank saying that Turkey "should cut this high interest rate", even as economists and traders expect another rate hike of as much as 400 bps to be announced shortly. While bashing the bank, Erdogan repeated his bizarre "theory" on the relationship between interest rates and inflation, saying that rate hikes only lead to faster price gains. Erdogan claimed that "interest rate is the reason, inflation is the result" and said that "if you are saying the opposite, you don’t know this business." While conventional economics says that higher rates slow demand and lower inflation, Erdogan has long preached the opposite even as the market repeatedly told him he is wrong, sending the lira crashing in recent months and making it one of the worst performing currencies of 2018, plunging over 41% YTD. Erdogan also said that Turkey "will suspend some tendered projects" that haven’t started yet, and explained that his "sensitivity on interest rates remains the same" even as he clarified that the central bank is independent and will take its own decisions, even as he made it painfully clear that a major rate hike will be frowned upon. “This is not a crisis, it’s a manipulation" he concluded. The Turkish central bank is set to announce its benchmark one-week policy rate at 2 pm in Istanbul. The median estimate in a Bloomberg survey forecast the rate would be increased to 21 percent from 17.75%. And following a few weeks of calm, the TRY promptly crashed, tumbling as much as 3% on Erdogan's comments, which will now make any announcement by the central bank moot as traders panic what Erdogan may do even if the CBRT does hike rates as expected. One potential silver lining: as Bloomberg's Mark Cudmore points out, "by the sounds of things, there’s a possibility for some form of capital controls will be implemented, potentially killing speculative lira shorts." And while that might save the lira from collapse in the short-run, "it will hurt the economy for a long-time to come."